This package offers a complete state-of-the-art look and reduces machine exposure to the harsh wash bay environment. Underneath the covers, a separate enclosure for air valves has been added to the bridge, while all fluid valves have been removed, increasing overall reliability and serviceability. The feature offers added durability along with an increase in ease of serviceability. The all-stainless steel frame houses a dedicated fluid manifold designed to reduce fitting connections and leak points. The chemical injection manifold has been repositioned for easy service access and increased durability. The LaserWash 360 Plus is built using all stainless steel and aluminum for excellent resistance to water and chemical corrosion. The shape of the anodized extruded aluminum rails in the main bridge and trolley allow for an enclosed roller design, enabling an extremely low rolling resistance. This reduces the power needed to move the machine and eliminates the need for rail heating in cold weather climates by preventing water from accumulating and freezing on the roller path. 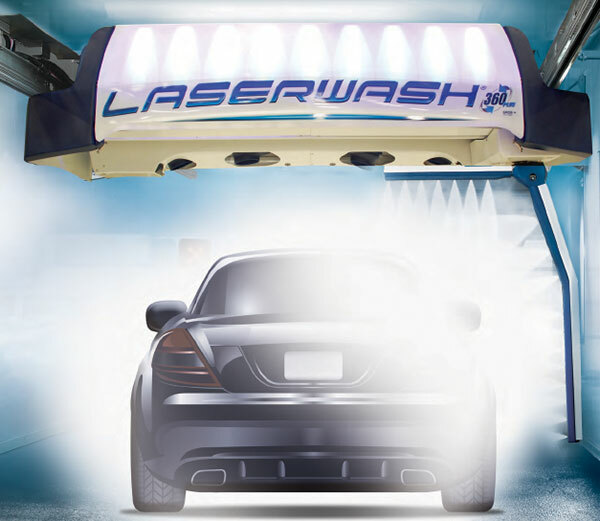 Standard with every LaserWash 360 Plus is an advanced wash control system which allows you to access all key operating functions of the wash equipment through any web browser without additional or special software. You can configure wash packages, program machine functions and monitor sales activity remotely over the internet. This easy-to-program capability keeps you in anywhere, any time.